The Hopkins brothers, William and Hubert, from Saint Louis, are the holders of more than 30 patents for 10-key adding machines and calculating mechanisms. The older brother, William W. Hopkins (1850-1916), (see biography of William Hopkins) worked as a minister, but was interested in mechanics since his youth. His first patents were granted in 1870s, and one of the early patents was namely for a adding machine (pat. No. US203151, not for a key-driven, but for a chain driven device), but he had also patents for other machines. William Hopkins moved to St. Louis in 1885, continuing to invent during those years and trying to find better ways to make an advanced adding machine. 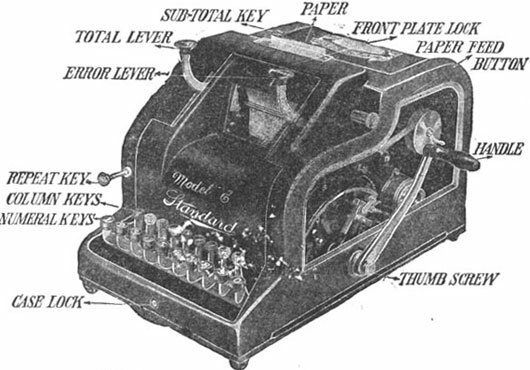 William Hopkins filed his first patent for a key-driven adding, subtracting and recording machine on October 4, 1892. The patent (see the patent of Hopkins No. US517383) was granted in March, 1894. Sometime in 1890s William Hopkins founded Standard Adding Machine Company, which was the first company to release to the market a successful 10-key adding machine, launched in 1901. In 1903 the company moved to a new building on Spring Avenue, St. Louis (see the upper image). The first model soon became quite popular and was followed by others (see the lower image). 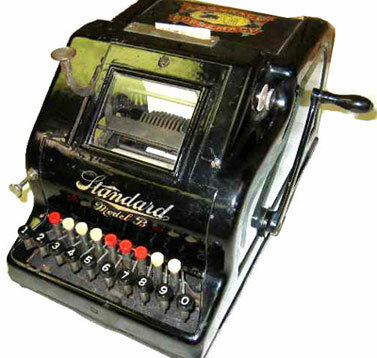 The Standard was the first 10-key, visible printing adding machine to achieve wide distribution. The Hopkins' original construction won an international grand prize during the 1904 Saint Louis World's Fair and was heralded as a modern life preserver in an office journal. The ten keys are placed in one horizontal row, underneath which are the nine tabulator keys. In order to enter a number, the corresponding tabulator key must first be pressed. For example, if the amount to be added has four places, then first the tabulator key marked 4 must be pressed. The amount is entered from left to right. For example, if the amount is 743.10, then the digits 7, 4, 3, 1, 0 are typed one after another exactly as they would be typed on a typewriter. The machine was produced in relatively large numbers between 1903 and 1913 (e.g. 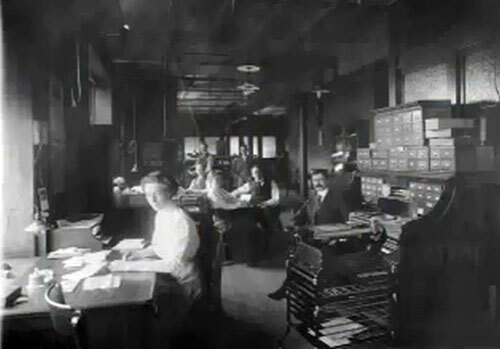 by the beginning of 1905, the company had already sold over 3400 machines), and initially Standard Adding Machine Co. prospered, and achieved a big success because its machines were much less expensive to manufacture and simpler to use. However later several other companies released more advanced machines. When in 1916 William Hopkins died, Standard Adding Machine Co. began to decline, to be closed in 1921. In early 1902, William's younger brother, Hubert Hopkins (1859-1920), prototyped a quite advanced 10-key adding-printing machine and in January, 1903, filled a patent application. The patent was granted as late as in 1912 (see patent US1039130), but meanwhile it was implemented in several machines, including the quite popular Dalton adding machine, which proved to be the most important of the printing, 10-key adding machines.